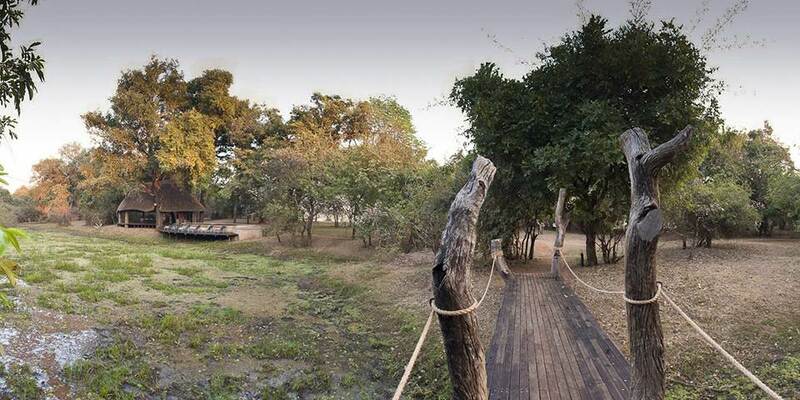 Nestled under the shade of tall mahogany, ebony and sausage trees, Nkwali Camp is located on the banks of the Luangwa River, overlooking the South Luangwa National Park, where leopard often roam along the banks and can be spotted from camp. 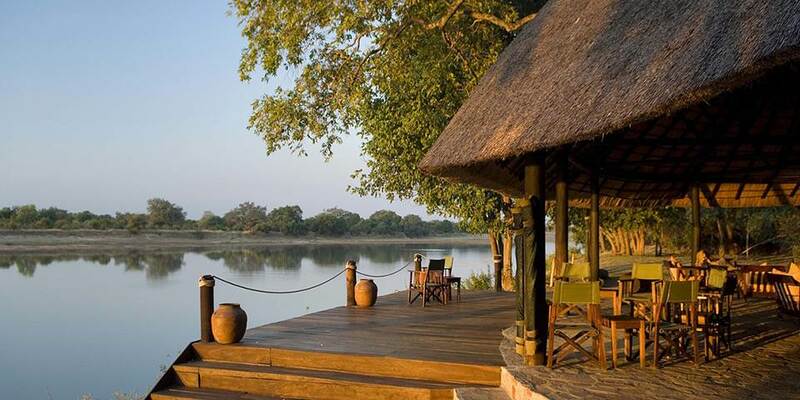 It is a permanent camp and one of only a few properties in Luangwa to be open all year round. The surrounding area is superb game viewing country; huge ox-bow lagoons, beautiful woodland and open grasslands. Often much can be seen around the Nkwali Camp’s area as in the National Park including leopard, lion and occasionally wild dog. The area is particularly good for elephants and Thornicroft giraffe (an endemic species). Elephants also regularly cross the Luangwa River, which can be seen from the bar area, or they come to the waterhole near the thatched dining room, unperturbed by the presence of humans. 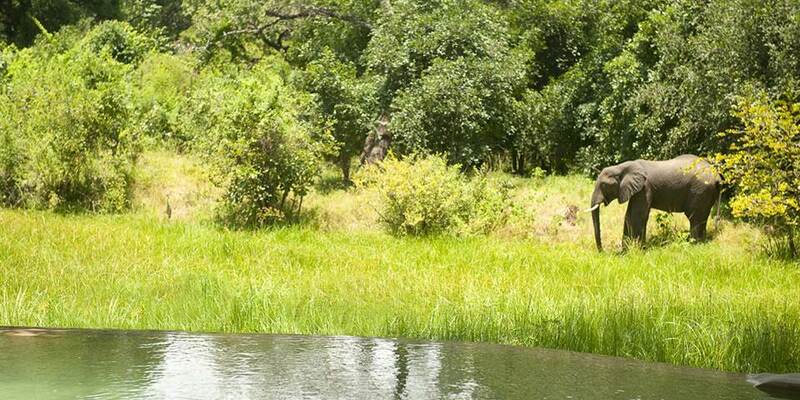 Activities at Nkwali Camp are tailored to guest’s requirements and usually take place within the National Park. 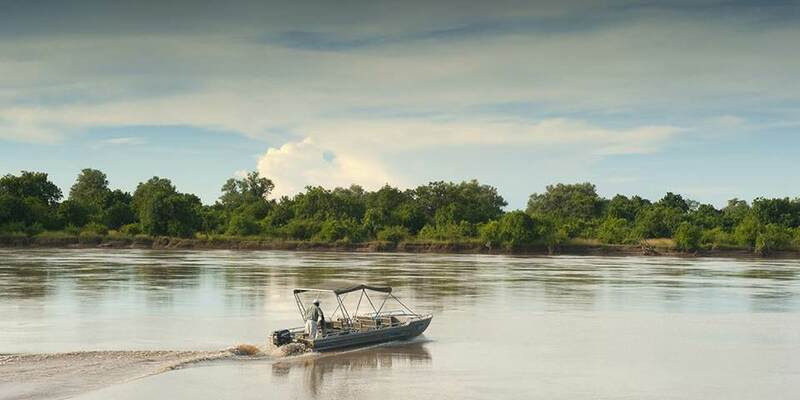 Just downstream from camp is a private pontoon which enables vehicles to swiftly enter the park, avoiding the worst of the crowds in the game rich Mfuwe area. Guests can cover a large game viewing area from Nkwali Camp. This central area of the park is accessible all year and the game are very relaxed and used to vehicles, allowing for great photographic opportunities of wildlife up close. There should be plenty of lions, leopards, jackals, spotted hyenas, elephant and buffaloes, as well as a wide range of lesser game and some excellent birding. Day and night game drives in open top safari vehicles offer guests an uninterrupted view of the wildlife. Walking safaris are led by a knowledgeable guide and escorted by an armed National Park ranger. The standard of guiding is outstanding and the guiding team members are passionate and impart some amazing bush insights. Boating can be done seasonally (end of December until April) allowing guests to explore the lagoons for enhanced game viewing and birding. Cultural visits to nearby Kawaza Village and the schools can be arranged, giving a more holistic experience of the Luangwa Valley. The centre of Nkwali Camp is dominated by an enormous ebony tree around which the bar is moulded, set right on the edge of the Luangwa riverbank. Guests can enjoy a cool drink on the bar deck cantilevered over the river, or around the camp-fire, whilst watching the sunset. Various comfortable sitting areas are scattered throughout this ‘chitenge’, which also houses a small reference library. 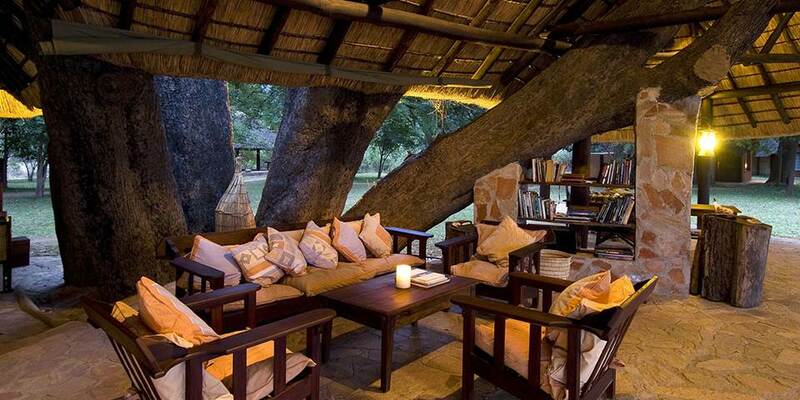 Across the lawn, set back from the river and overlooking a waterhole where elephants often come to drink, is the thatched dining room, although most meals are served under the trees by the lagoon, the river, on the deck, or in the bush. 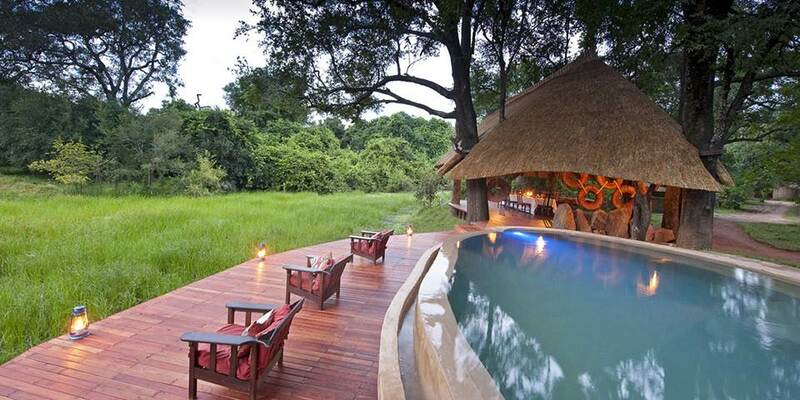 Game viewing from the main deck is a major feature of the camp and really can be impressive. Elephants are regular visitors, lured in by the shade, the lagoon and the seed pods which fall from the ebony trees. Nkwali Camp also has a swimming pool around which comfortable loungers offer a welcoming sanctuary for relaxing between safaris. The six open-front chalets, with bamboo-woven walls, thatch roofs and open-air adjoining bathrooms, offer a rustic luxury style and open up to magnificent views of the river. High ceilings and flagstone floors help keep the rooms cool in the summer and warm during winters. 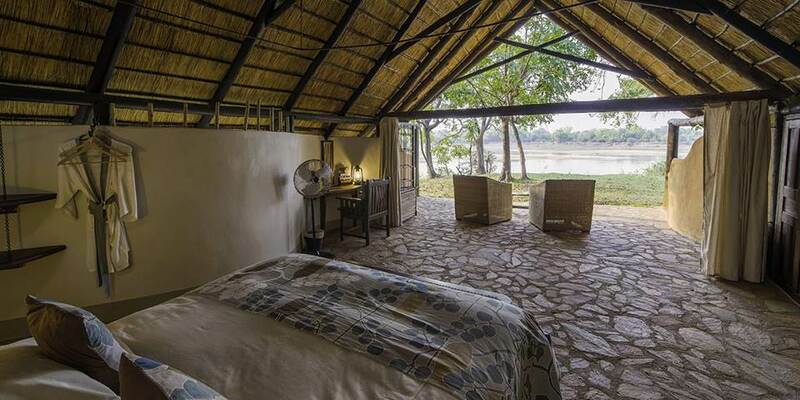 They are completely open at the front to allow guests to lie in bed and watch the animals meander through camp and along the banks of the river. At night the mosquito nets are lowered over the beds and the French-style grill doors are drawn across to keep out unwanted visitors.